Fashions in prison uniforms at the Hobart Gaol in the 1870’s varied according to the class of criminal, his trade or job, and the season. Thomas J. Nevin photographed prisoners William Smith and James Mullins at the Hobart Gaol in July 1875 wearing the grey uniform and leathern caps for police records. 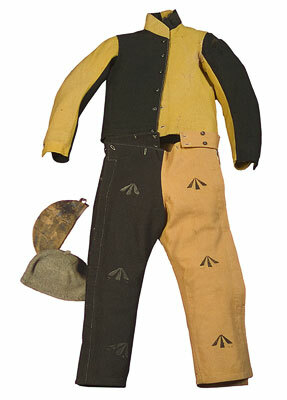 A visitor to the gaol in July 1882 noted the grey jacket and leather caps of the old hands, and the yellow and black uniforms worn by prisoners working in gangs at large in the community. 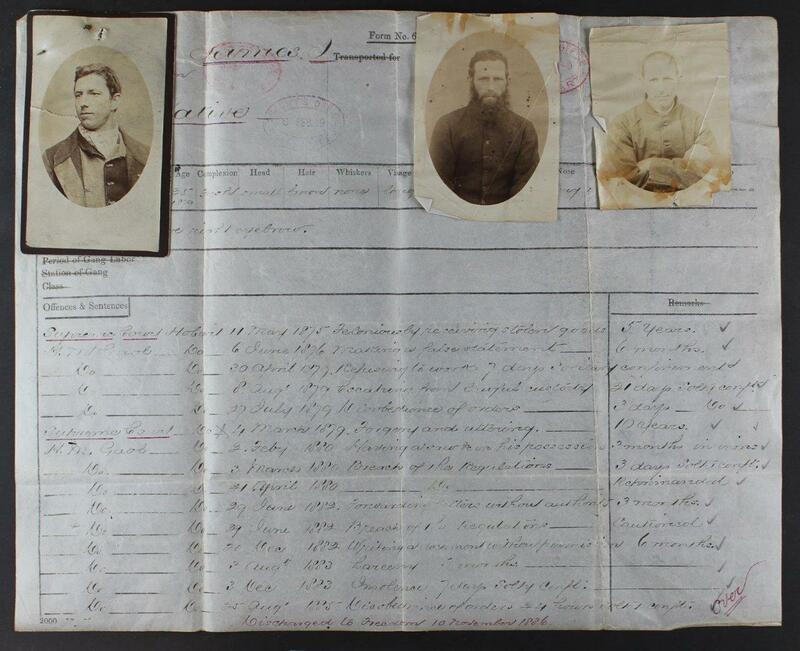 The prisoner in these three photographs, Joseph James Cooper, wore three different uniforms on the three different occasions while under sentence: in 1875 for burglary; in 1879 for forgery and uttering; and in 1889 for arson. Above: three mugshots of prisoner Joseph James Cooper 1875-1889. Extreme left: photographed by T. J. Nevin at the Hobart Gaol on 5th August 1875 on Cooper’s assignment to the work gang at the Royal Botanical Gardens, wearing the distinct uniform of yellow and grey which easily identified prisoners under sentence working in the community. Middle: photographed by T. J. Nevin on Cooper’s arrest, unshaven, in the grey uniform he wore when brought up from the gaol for his arraignment at the Supreme Court on 4th March 1879, on the charge of forgery. Extreme right: photographed by Constable John Nevin at the Hobart Gaol on 13th June 1889-1890 when Cooper was sentenced to life imprisonment for arson at Launceston, and returned to the Hobart Gaol. Source: KLW NFC Group 2015 and the Port Arthur Historic Site Resource Centre. 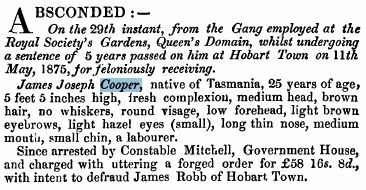 NB: Although the Port Arthur Historic Site holds this record,and even displayed it online as a banner on their Resource Centre page at one point (2015), this prisoner Joseph James Cooper spent less than four months at Port Arthur from May to August 1875. He was never photographed at Port Arthur at any time from his first conviction in 1875. 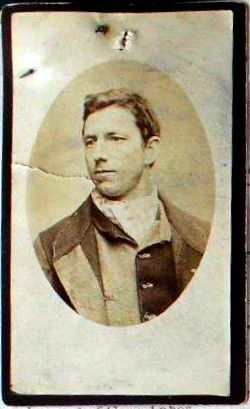 The same can be said of the many prisoners whose photographs were recently mounted on a lightbox wall there, and with the doubly misleading photographic attribution to their former Commandant at the prison, A. H. Boyd (1871-1873) who was not a photographer by any definition of the term. As a closed, insulated and fictive narrative of Tasmanian criminal history presented to tourists, this sort of deliberate falsification only serves to magnify the several deceptions of dark tourism played out at the Port Arthur penal heritage theme park, and at the expense of ordinary facts: that most if not all the photographs of those prisoners displayed on the wall were taken at the Hobart Gaol in Campbell St. Hobart and not at Port Arthur in the 1870s, and they were taken by the government contractor, commercial photographer and civil servant Thomas J. Nevin. 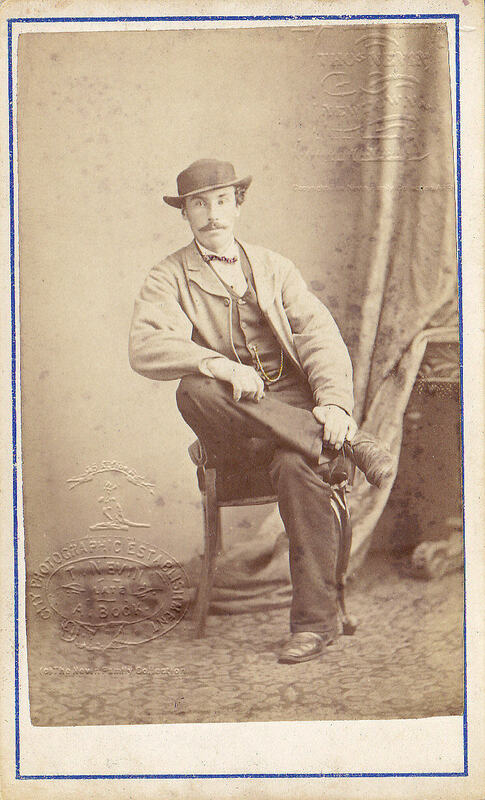 Joseph James Cooper was working as a porter at Mr Bidencope’s shop and clothing factory when he was arrested for burglary at the factory in 1875. He was born to carpenter Elijah Cooper and wife Susannah in Hobart on 6th November 1853 and had no prior convictions, He was arraigned at the Supreme Court, Hobart, on 11th May, sentenced to five years, imprisoned at the Hobart Gaol until the 29th May 1875 when he was sent to the Port Arthur prison, 60 kms south of Hobart. 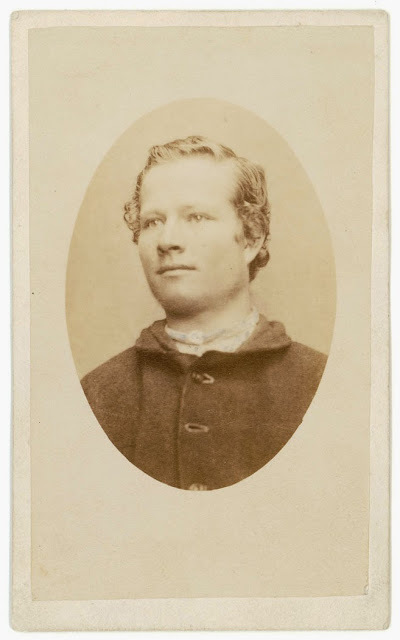 Within four months, he was sent back to the Hobart Gaol, on 5th August 1875, and photographed in the parti-coloured prison uniform of yellow and grey by Thomas J. Nevin prior to assignment in a work gang at the Royal Botanical Gardens on the Queen’s Domain. Above: police gazette notice of Joseph James Cooper’s arraignment, 11th May 1875. 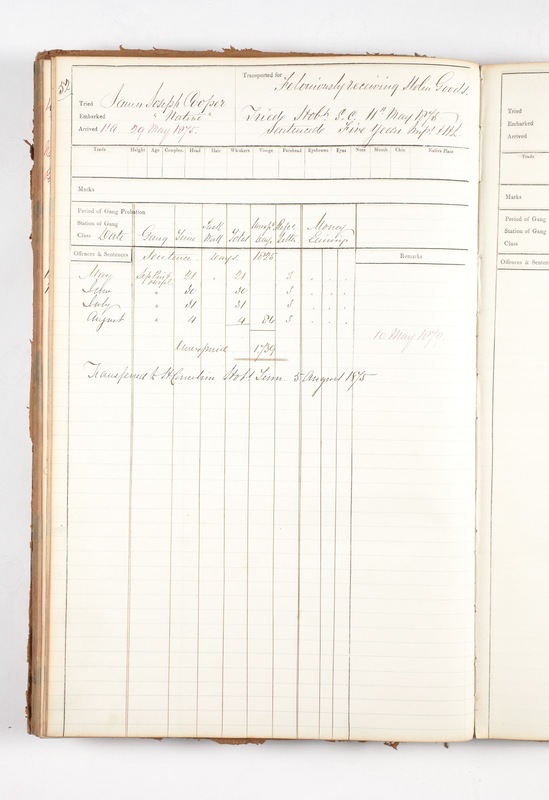 Below: Cooper’s record of earnings May -August 1875 and transfer from Port Arthur to the Hobart Gaol on 5th August 1875. Police gazette notice of 21 January 1879. 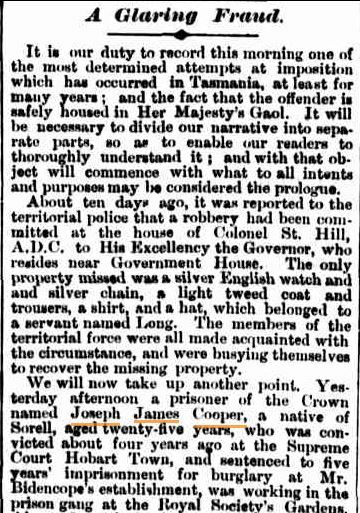 On the 29th instant, from the Gang employed at the Royal Society’s Gardens, Queen’s Domain, whilst undergoing a sentence of 5 years passed on him at Hobart Town on 11th May, 1875, for feloniously receiving. 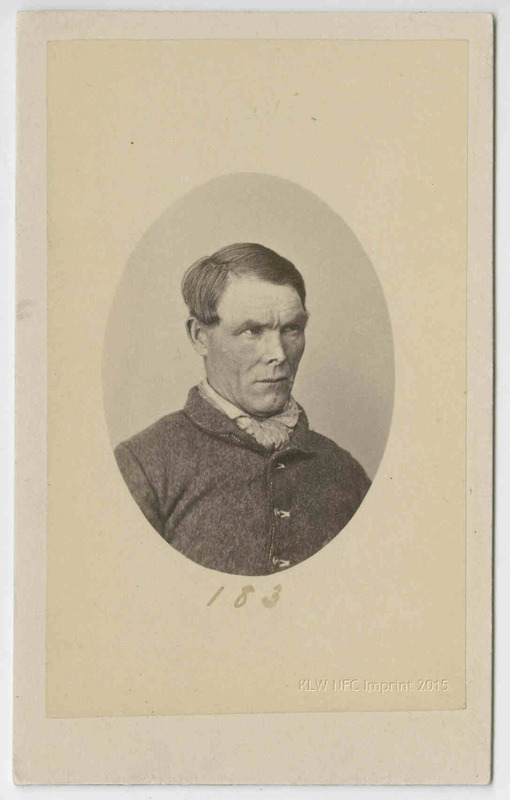 James Joseph Cooper, native of Tasmania, 25 years of age, 5 feet 5 inches high, fresh complexion, medium head, brown hair, no whiskers, round visage, low forehead, light brown eyebrows, light hazel eyes (small), long thin nose, medium mouth, small chin, a labourer. 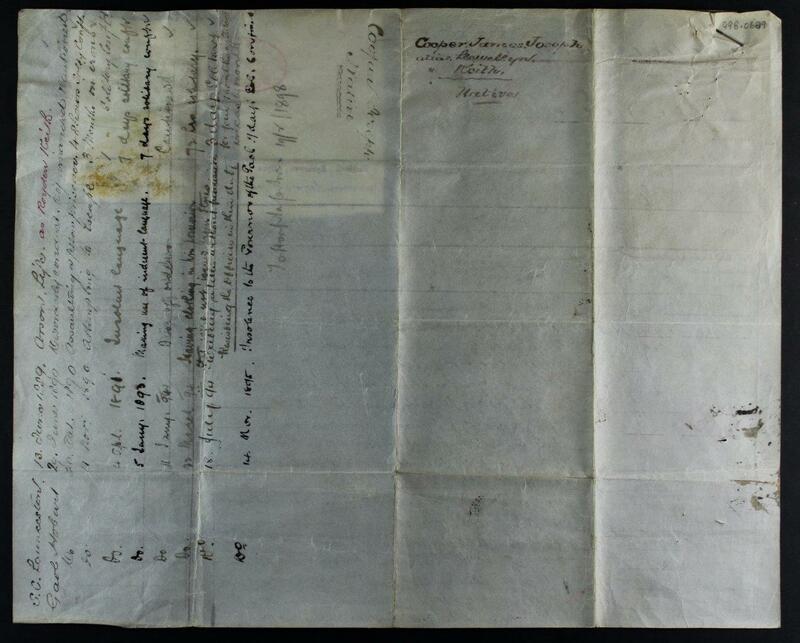 Since arrested by Constable Mitchell, Government House, and charged with uttering a forged order for £58 16s 8d., with intent to defraud James Robb of Hobart Town. When Cooper was arrested, he had grown a beard. 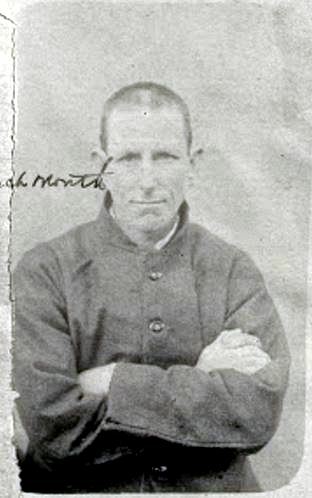 He was photographed by Thomas J. Nevin at the watch house on arrest, still unshaven, dressed now in the plain summer prison uniform. Joseph James Cooper and his accomplice, compositor Charles Fyshe whose handwriting was identified on the forged cheques presented by Cooper at Messrs Sadler’s and Walch’s shops, were brought into the court from the Hobart Gaol wearing prison grey. FORGING AND UTTERING. – Joseph James Cooper and Charles Fyshe, were brought from the gaol in the Government clothing, the former charged with having on the 29th day of January, uttered a forged order for £58 16s, with intent to defraud, and the latter with having forged an order for £65 10s 6d with a similar intent. The facts of this case have already been made public, the prisoner Cooper, who was employed in the Botanical Gardens, having taken an expedition to town in the afternoon of the day mentioned, and passed the forged order on Mr. Robb, the sadler, of Elizabeth-street. He also endeavoured to pass the other order at Mr. Walch’s shop. The greater part of the evidence against the prisoners was taken on Friday last. Cooper yesterday again cross-examined the witnesses as to matters of detail, and incautiously evinced a knowledge of the interior of Colonel St. Hill’s house, that was startling. The following additional evidence was taken. Thomas Harper, a fellow prisoner of Cooper’s who lent him the pair of spectacles, on the day he went to town; Constable Waller of the Rural Police, who found the spectacles in the same place as the clothes, but on the next day, and Richard Long, a servant of Colonel St. Hill’s, from whom the clothes were stolen on 22nd January, and who identified them as his property in Court. Mr. Superintendent Propsting was sworn, and deposed that a message had been sent to him from the gaol that morning that Fyshe wanted to speak to him. Fyshe was brought to the watch-house, and there owned to having filled up the bodies of the cheques at the suggestion of Cooper, who told him that Mr. George Guest was his uncle and had monies belonging to him, more than would cover the amounts of the cheques. This statement was not made in the hearing or presence of Cooper. Fyshe further stated that he did not know he was doing wrong, and only wrote the cheques to oblige Cooper. No inducement or threat was held out to Fyshe to elicit this statement. The prisoners were then committed to take their trial at the next Criminal Sessions. The Mercury reporters had a field day with this case. In this article of 30th January 1879, every detail of the the case was recounted, mostly of the events from accounts by Cooper’s victims. 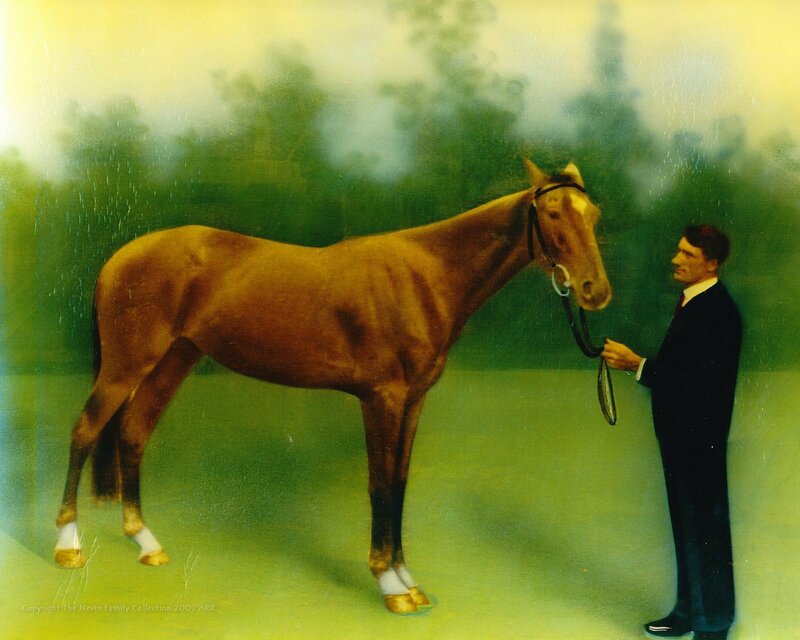 Praise was given to Detective John Connor’s mental agility in unravelling the clues which led to Cooper’s eventual arrest by Constable Mitchell at Government House. The greatest credit is due to Detective Connor and Constable Anderson for their exertions in endeavouring to arrest the man, and for their sakes it is to be regretted that they were not successful. It is very probable that Cooper will be brought up at the Police Court this morning. Source: A Glaring Fraud. (1879, January 30). Tribune (Hobart, Tas. : 1876 – 1879), p. 2. 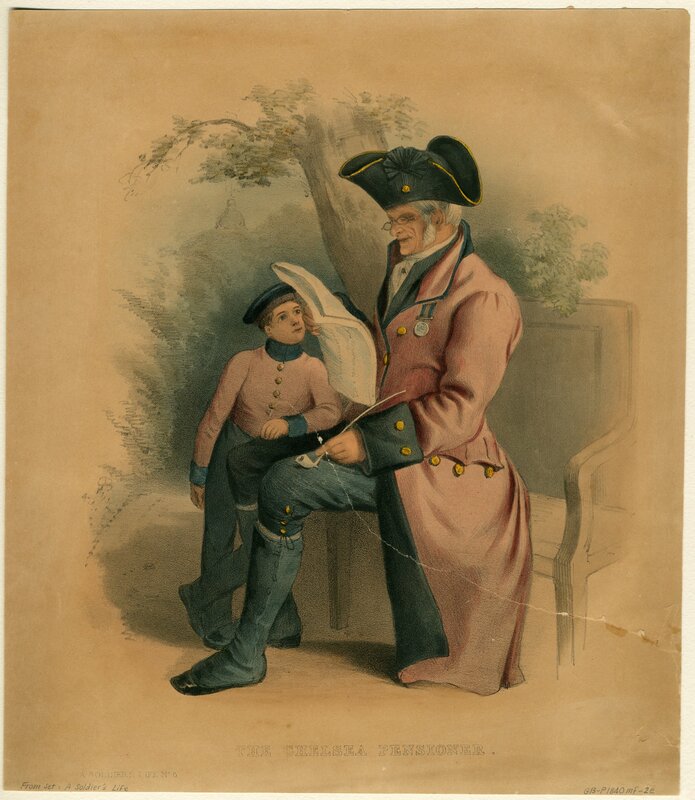 For reason best known to the writer of this short notice, Joseph James Cooper was likened to Charles Dickens’ character, the Artful Dodger, from his greatly loved novel, Oliver Twist, although Cooper was no juvenile pickpocket. The press persisted with the nickname “the Artful Dodger” until March when the excitement finally abated on Cooper’s sentence of a further ten years. 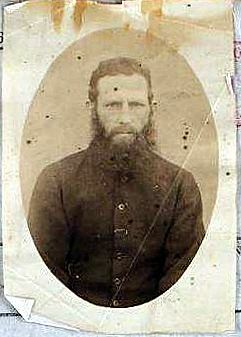 Joseph James Cooper was brought from the Hobart Gaol to court wearing the grey prison uniform. THE ARTFUL DODGER. 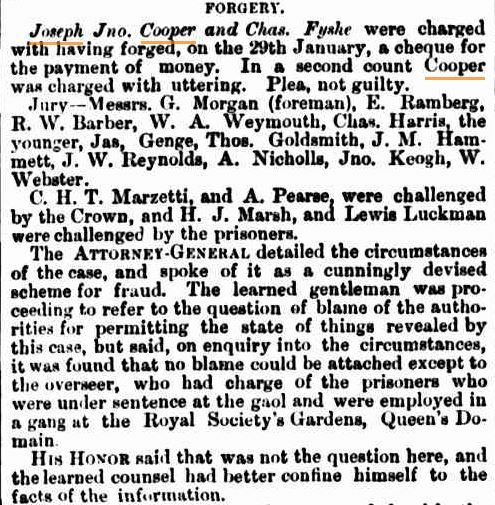 – James Joseph Cooper, who said he was a native of the colony, was brought up in prison grey, charge pro forma, with having on the 29th instant, feloniously uttered a forged order for payment of £58 16s 8d., with intent to defraud, and remanded till February 7. 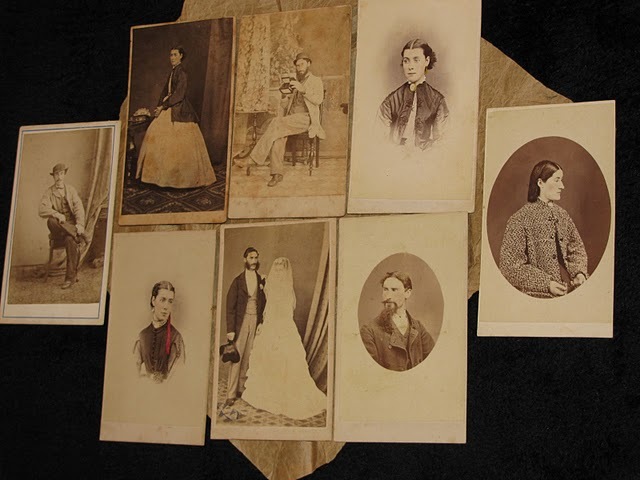 These later photographs of Joseph James Cooper, one pictured with a beard, and the third, pictured completely shaved of hair and whiskers, were reprinted several times from the original negatives produced at the Hobart Gaol by the Nevin brothers per police regulations. The portable fold-up rap sheet with copies currently held at the Port Arthur Historic Site Resource Centre was acquired there most probably as an historic artefact from Ratcliffe’s convictaria shop and museum at Port Arthur in the 1920s-30s, where it was displayed purely in the interests of tourism. 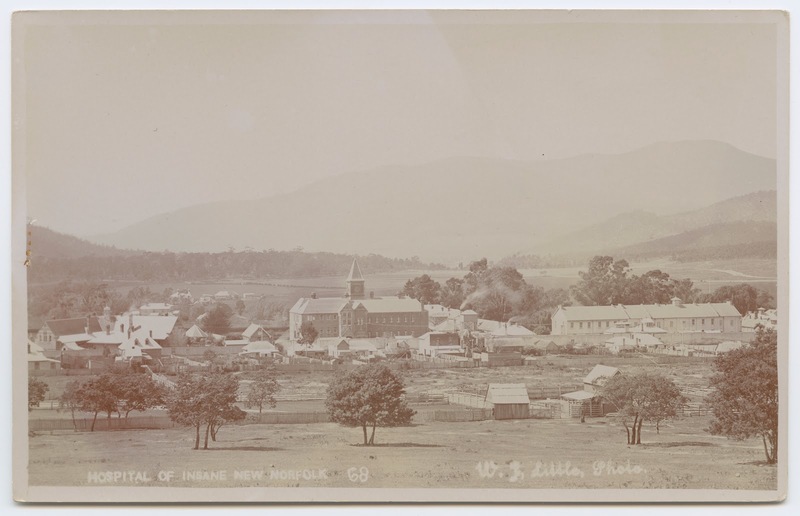 The other two copies of the same photographs on the black and white rap sheet were pasted onto the document and bound into book-form at the Sheriff’s Office, Hobart Gaol, now held at the Archives Office, Tasmania. 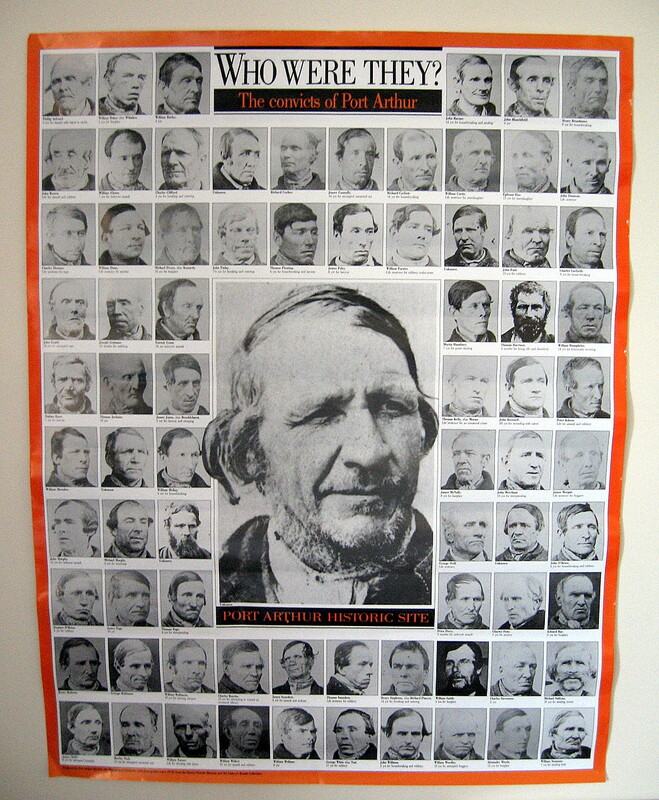 The central police records registry, the Municipal Police Office at the Hobart Town Hall also kept additional compilations of numbered prisoner mugshots in PHOTO BOOKS, referenced sometimes as such on the prisoner’s rap sheet. The first of these three mugshots of Joseph James Cooper wearing the yellow and grey prison uniform, which is attached with a rusty pin to the Port Arthur document, was sourced as an estray from the Municipal Police Office, Town Hall. 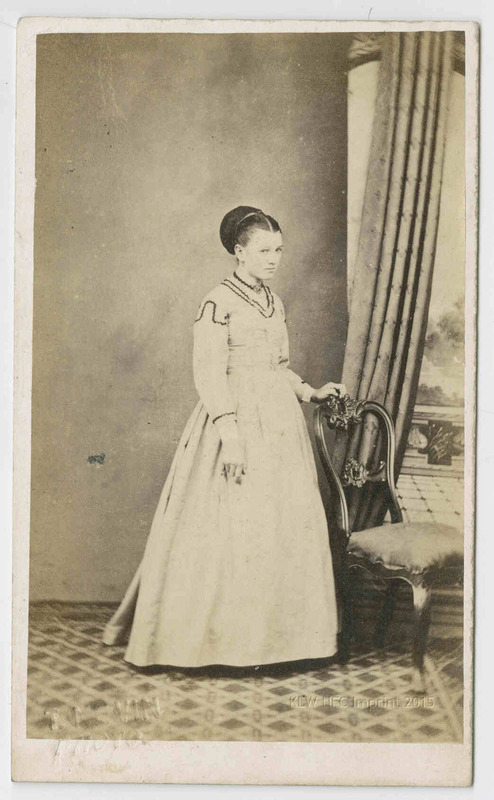 It was taken in 1875 by Thomas J. Nevin on commission and mounted as a carte-de-visite within the conventions of commercial studio portraiture. It too was probably sourced from Ratcliffe who bought such items at auctions, eg. 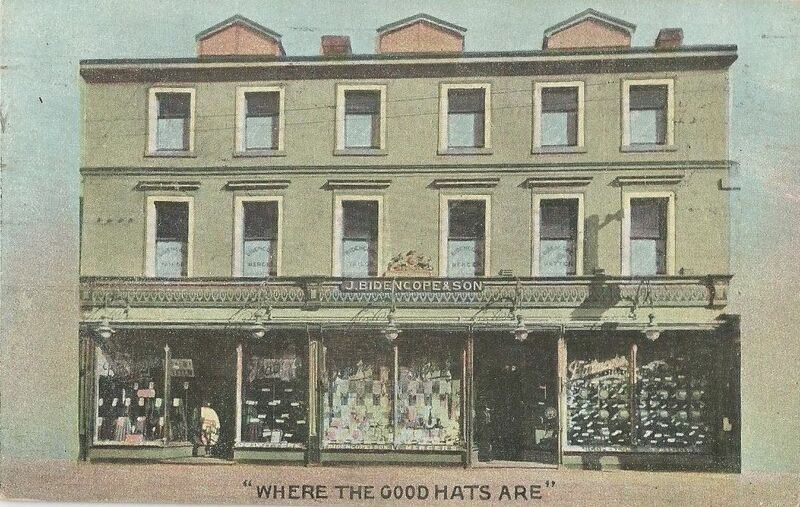 see Beattie’s catalogue 1916. 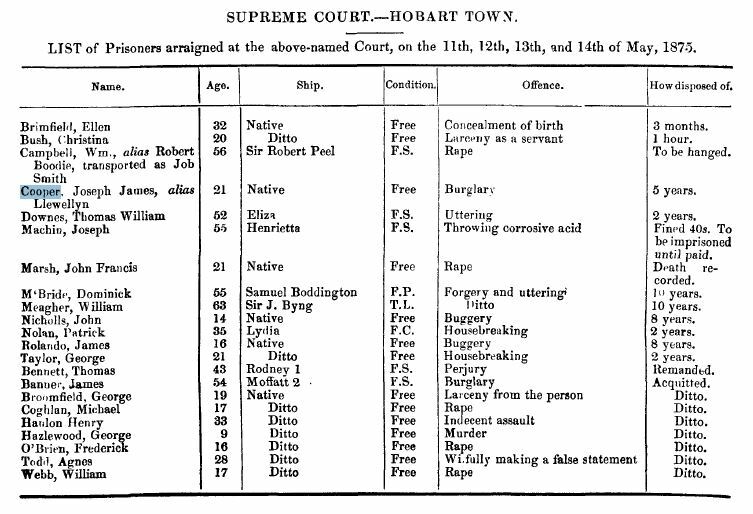 Police gazette notice: James Joseph Cooper was arraigned in the Supreme Court Hobart on 4th March 1879. Described as 25 years old, native (locally born), under sentence for forgery and uttering, sentenced to ten years. Attorney-General W. R. GIBLIN acted for Cooper’s defence, attempting to shift blame to the overseer of the gang in charge of Cooper and the other prisoners under sentence, for which His Honor admonished him to confine the defence to the facts. Joseph James Cooper and Chas Fyshe plead in court. FORGERY. Joseph Jno. Cooper and Chas. Fyshe were charged with having forged, on the 29th January, a cheque for the payment of money. In a second count Cooper was charged with uttering. Plea, not guilty. Jury-Messrs. G. Morgan (foreman), E. Ramberg, B. W. Barber, W. A. Weymouth, Chas. Harris, the younger, Jas, Genge, Thos. Goldsmith, J. M. Hammett, J. W. Reynolds, A. Nicholls, Jno. Keogh, W. Webster. C. H. T. Marzetti, and A. Pearse, were challenged by the Crown, and H. J. Marsh, and Lewis Luckman were challenged by the prisoners. The ATTORNEY-GENERAL detailed the circumstances of the case, and spoke of it as a cunningly devised scheme for fraud. The learned gentleman was proceeding to refer to the question of blame of the authorities for permitting the state of things revealed by this case, but said, on enquiry into the circumstances, it was found that no blame could be attached except to the overseer, who had charge of the prisoners who were under sentence at the gaol and were employed in a gang at the Royal Society’s Gardens, Queen’s Domain. His Honor said that was not the question here, and the learned counsel had better confine himself to the facts of the information. The ATTORNEY-GENERAL then proceeded with the evidence, the principal part of which has already been published in The Mercury. Joseph James Cooper committed numerous offences and misdemeanours while in prison. He was released to freedom in 1886 and thereafter used aliases, whether as James Cooper rather than Joseph Cooper, as Keith Cooper and as Keith Roydon until arrested as Roydon on charges of arson. 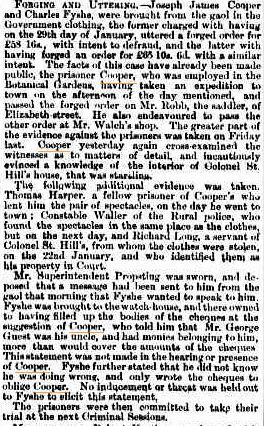 He was sentenced to life imprisonment at the Supreme Court, Launceston on 13th June 1889. Returned once more to the Hobart Gaol in 1890, he was shaved and photographed by Thomas Nevin’s brother Constable John Nevin. His trade was listed as “tailor”. Cooper committed further offences every year until sent to the Hospital for the Insane at New Norfolk on 19th February 1898 where he most likely died. 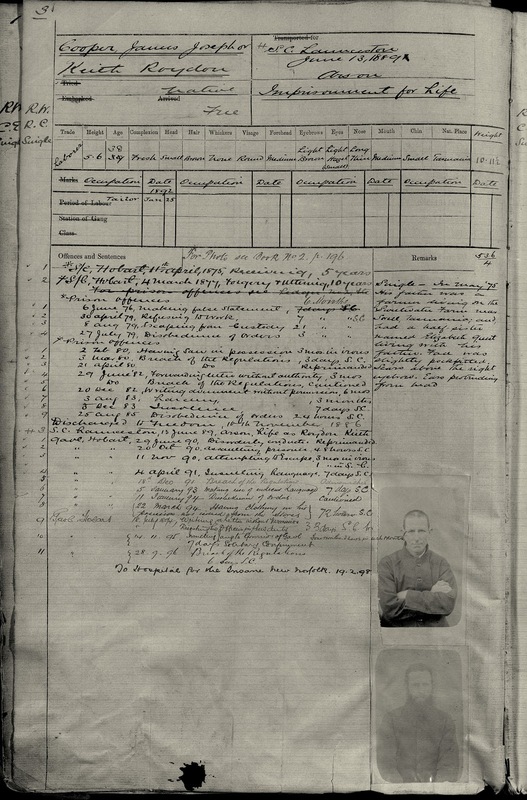 Source: “Australia, Tasmania, Miscellaneous Records, 1829-1961,” database with images, FamilySearch (https://familysearch.org/ark:/61903/1:1:QVBD-SFKS , James Joseph Or Keith Cooper Or Roydon, 13 Jun 1889; citing Imprisonment, Tasmania, Australia, p. 3, Tasmanian Archives and Heritage Office, Hobart.